It all started with a typo my friend Mitch made while were setting up an upcoming Gamma World adventure on Facebook. Gramma World created a few chuckles and seemed to have run its course except that it kept striking me as funny. 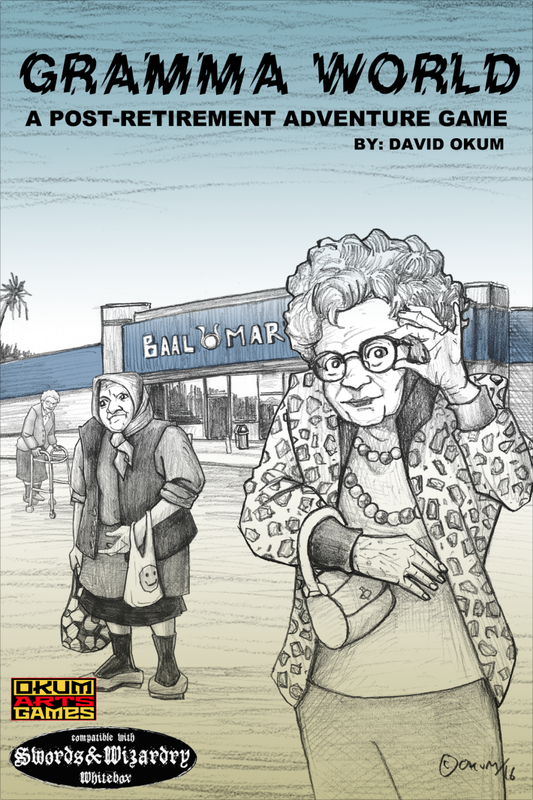 A few times a day I would think about it and finally I drew a few pictures of sassy grammas and thought, “this game MUST exist!” As a parody inspired by a gonzo post apocalyptic adventure I couldn’t resist creating a setting of elderly people trapped in a world they never made. The dungeon crawl explorations and strange familiarity of the mutants of Gamma World fit nicely with this conceit. When asked to describe the influences and flavour of this game I would consider it an amalgam of Scooby Doo Mysteries meeting the Golden Girls. Compatible with Swords and Wizardry Whitebox and all other versions of the original game. Welcome to the forum, okumarts! Now get off my lawn! (Just kidding). Have to check this out; seems ridiculously funny.